Alex Deans is a chemical engineering major in his senior year at McGill University. He is also the inventor of the iAid, a carefully engineered belt inspired by bat sonar that helps the blind and partially sighted navigate the world without the help of guide dogs or white canes. CompassList caught up with Deans after the recent South Summit in Madrid, where he gave one of the keynote speeches, to discuss how he conceived and developed the wearable tech. Q: How would you describe the iAid to someone who doesn't know anything about it? A: The iAid is like a friend who can be by your side 24/7, who can hold your hand and lead you to your destination. 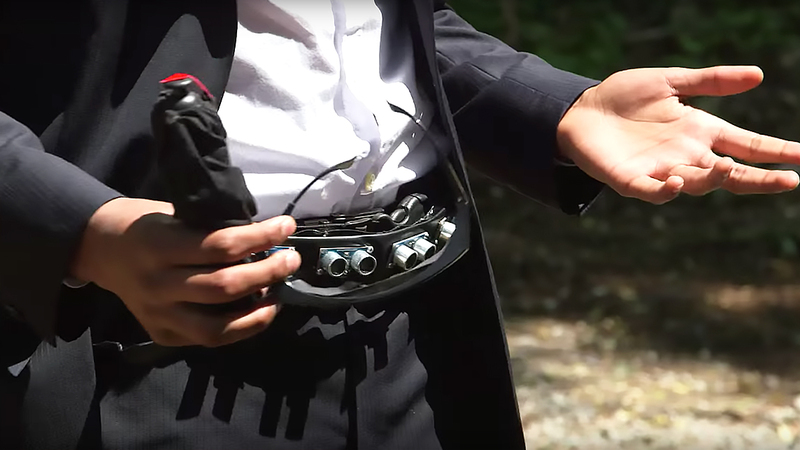 Behind the scene, we have a hardware component that sits on your belt; it uses sensors, ultrasonic GPS, Bluetooth and machine learning to take information about your surroundings – so it compiles where objects are, where street corners are – and syncs it with your phone. You then talk to your phone, tell it where you want to go. All the information is relayed to the user only through one thing, the joystick. The stick will turn automatically in your hand to show the direction to the destination, and tilt to show how far away you are. That’s really the only thing the user has to worry about. So, I can say, “Take me to Wendy’s [house],” and iAid is going to plan the fastest route to your destination, taking into account the pedestrian pathways and all the dynamic obstacles in front of you – bicycles, people, cats, anything. And as you walk, the joystick will be adaptive, turning and tilting, moving you around obstacles while keeping you on the correct path to your destination. That’s why I think it’s been so easy to use: it’s so intuitive, because you’re just feeling the touch and letting that guide you. Where did you buy the robotics equipment that you started out with? You’ve said that you had 100 bucks worth of equipment to start with. It was probably around like 60 bucks [Canadian dollars] of hardware. The first stuff was all from robot shops online: ultrasonic sensors, GPS plates, etc. The rest of it was just the wires and tape – lots of tape was used – and I kind of made my own belt so I could anchor all the stuff on it. All those other associated costs took up the other 40, 50 bucks. How did you know that you wanted it to be a belt? I didn’t. It actually started out as a little sensor mounted on your chest and it was really simple so if something came in front of that sensor, there would be a really big beep, so then the user would stop immediately. But it didn’t really give you any feedback. As it progressed, it kind of made its way down to the belt where it could sweep across the surroundings and figure out where everything was. You came into it with no robotics or programming experience – you just had a bunch of wires and some GPS shields. What did you do once you had them? You kind of described it really well – it was a whole bunch of wires. Probably the first couple of months, I was trying to rearrange the wires in a way that made sense, in a way that ended up working, and then I actually figured out why it worked. At least the first six or seven months was pure experimentation, not knowing anything about what I was doing, just kind of plugging things in and seeing what worked, what didn’t, and why. I used to take the device to the CNIB, the Canadian National Institute for the Blind, and have users test it and give me feedback. I would go home and rearrange the wires and change some of the software to see where that led. That kind of fast iteration led to a much more developed prototype. What was it like testing the device out with people? That was the best experience of this whole thing, for sure, because it teaches you to think about the world in a different way. You have to see the world from the perspective of a blind person. A railing might be very useful to them, just to identify what floor they’re on. They’ll see what the texture of the railing is and figure out what floor they’re on, whereas I would not even consider it at all. So it was kind of picking up on those small things and figuring out how they can be implemented into the device. In terms of testing the iAid, I had 30 volunteers when I was just starting out. I would strap the device onto their belt and have them navigate as how they would in everyday life, so just around their apartment complex, going to the cafeteria, sitting down, getting up, walking around walls and having a lot of people move in front of them and see if they could make their way through that. All the little things I picked up along the way were kind of amalgamated into one solution that worked. How do you teach yourself to program? Which language did you start with? I started with C and C++. Yeah. That’s why it took so long! It was a lot of smashing my head against the computer, saying why isn’t this working? I didn't take any classes because I think they were oriented toward a more linear approach to learning the material, and I didn’t really have time for that because I was just trying to get things to work as fast as possible. Most of my education in coding came from people online in forums. I would correspond with inventors and coders online who would give me feedback on specific problems that I posted and lead me through an approach that they thought might work, and then I’d go back and figure it out. But once things started becoming a little bit more complex, it was really hard to describe the actual problem just through email or online. Then I figured out I had to take it to someone in person to see if they could figure out why things weren’t working. At one point, you went to the US to get help from some inventors with your device. I grew up in Windsor [the southernmost city in Canada, across the Detroit River from the US], so I would spend a lot of time in the US. I found this group in Detroit called i3Detroit [based in Ferndale, Michigan], and they have a massive warehouse and they just build things. It was just a very fun, creative atmosphere. I was having problems with GPS, Bluetooth and those kind of things, and I would sit down with them and figure out where the problem was. What were some of the failures and lessons you encountered over the course of the six years you worked on the iAid prototype? Well, there were a lot, a lot of failures. That was a big thing that I learned – because, especially toward the beginning where I was coming in with absolutely nothing in terms of technical skills – recognizing the value of teamwork, finding a community that I can bounce ideas off, and crowdsourcing creativity and knowledge. I think that's what helped me to get a foot up in the first few months; otherwise I would've been stuck for a long time. The second big thing was trying to put myself in the perspective of the user, and not as an inventor. I originally started making the device just by researching what problems blind people experienced when they navigated, but the stuff online was very different from what I found when I was actually talking to the visually impaired community. As I started having more of a relationship with them, I got to understand more about how they navigate, and that helped the iAid move along a lot faster. You have expressed that you would be interested in the iAid being used in places like Botswana [where Deans is going in spring 2019 to help screen people for visual impairments in collaboration with the Queen Elizabeth Diamond Jubilee Trust and Peek Vision], right? That’s definitely the plan. The challenge right now is bringing the cost of equipment down. The big advantage of iAid right now is how portable it is, how small it is and the effectiveness despite that. It’s very difficult to keep all three of those things in harmony when you're trying to bring the cost down. So that we haven’t quite figured out yet. How much does it cost to produce? Right now, it’s just under 100 bucks. We’re using a lot of technology that’s already available in phones right now, so we’re trying to bounce off what you already have in your pocket, which is also very prevalent in countries like Botswana. I think 80-something percent of people have phones there. But even with that, it’s hard to bring the cost down. Where are you in the process of bringing the cost down? Right now, we’re trying to balance that with bringing in new technology, such as adaptive machine learning. For example, if you have a door with a glass pane in the middle of it, sometimes some of the sensors won’t pick up that glass door. Other times they do. So we want the machine to learn to see that glass door, and every time it sees one after that to identify it as a glass door. That's the specific kind of problem we're dealing with right now. The cost is 75 bucks currently. Since 2015, there have been reports saying the iAid is going to go on the market. Where are you in that process? I think I said that when I was very naïve. Right now, we're testing it. It’s basically used at the institutes for the blind because the market process is something different with it being a healthcare product that's going to be used on the road alongside cars and bicycles and all this stuff. So that process is going to be much lengthier than I think I was saying when I was 15 or 14, however old I was. It will be more than three or four years [before the iAid gets to market] because we can get prototypes on the market that might work for certain scenarios, for example, indoor navigation. The device right now is perfect for that. It will take you around the apartment complex, at home, office, anything like that. And outside it will do very well alongside traffic and bikes, etc., but we’re not at the point where it’s safe 100% of the time – and that's where it needs to be, for market use. Many people encounter blind people in the street who need help regularly. Some of them might help the person cross the road, for instance, and then forget about it. But why were you then, as a 12-year-old who isn’t disabled, interested in helping? To be honest, I don't think that I realized how memorable the experience was when I actually had it. I helped her cross and then I went home and I did forget about it. A couple months passed and I was watching a documentary about how bats navigate, and I remembered her. I thought, bats can use echolocation, why can’t we do something similar for humans? And then I built this device, but still at that point it was a hobby. It was something I was doing because I was interested in tinkering with things. I don't think it was directed toward helping people. Then when I took it to the CNIB, I realized the impact it could have. And I met people like her and only then did the experience of meeting her really sink in and I realized how valuable it was. You’ve given a lot of speeches at high-profile events. What do you believe is the most important thing you regularly tell your audience? To be curious. My success so far has come not from any skills or knowledge that I had because, for the most part, when I’m starting up with projects, I typically have no knowledge about that specific area. So, for example, in developing the iAid, I had no technical skills. For this project with Peek Vision [in Botswana], I have no skills with macro lenses or working with phones in that kind of depth. With Chevrolet as well, I had no experience working with cars. I realized that the technical and all that stuff, it doesn't really matter, you can pick those things up or learn from people around you. The big thing is to have a curious mind and ask, why do things work, why do they not work and why not? Why can I not improve something and change it to make it better? I think that's where everything in my life so far has led from – just being able to ask questions like that and poke holes in things around me, and see what the good things and bad things are.